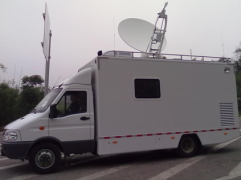 The Alignsat 1.8m vehicle-mounted antenna is a fly-away antenna equipped on large command vehicle, the system is quit suitable for the large emergency missions with the function of large capacity of information and high quality communication. Alignsat 1.8m vehicle-mounted antenna system is mainly consist of the 1.8m feed system, the three axis drive system, he automatic control system, the power drive system, the satellite attitude acquisition system, the beacon receiver system, etc. The whole system is divided in to two parts, one is inside vehicle control system, and another is outside vehicle antenna. The interconnection between two parts is simple and stable. Easy operating: No need for professional operators, the system can be pointed at the satellite within 3mins by using the one-key pointing function. Three operating mode: auto, electric, manual. Military quality：Using the environment resistant materials which meet the MIL-STD-810F requestment. The system passes the environment test for the harsh communication conditions. Perfect performance：High feed RF efficiency, high gain, low sidelobe, excellent cross polarization. The system can be operated in whole day with large torque and high accuracy transmission. The structure of the system is designed with high strength by using the military motor and reductor imported from Germany. Highly integrated：the system was put into a 2U standard box in which including a three axis positioner、a GPS receiver and a electronic compass, the system has the function of auto pointing satellite.